Oh dear, I feel my vision starting to blur a little bit, is there something wrong with me? If you find yourself asking this question, well, let me ask you the following questions. Are you someone who constantly stares at your computer screen or book? If the answer to this question is yes, than there is a possibility that continuously trying to focus your vision on something at a distance, the muscles in your eyes tense up, and that as the tension builds up to the point where it can no longer hold on any longer, your vision becomes blurry. This is also an illness correlated with age. As you age, the muscles in your eyes tend to weaken. Although there are no eye drops that heal the relaxation of muscles due to age, there are eye drops that help suppress the aging process of the eyes and blurred vision. I love the package for this eye drop because I think it is pretty obvious who the target is for this eye drop. 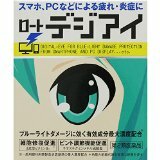 This is an eye drop for those who get blurry visions occasionally due reasons such as constantly staring at your computer or smartphone screen. It replenishes your eyes with all the vitamins, minerals, and other components necessary to help your eyes stay focus and give you the optimal vision possible at all times. This eye drop is mainly used for the failure of muscle contractions in the eye correlated to age. Due to this reason, the concentration of neostigmine methyl sulfate in this eye drop is higher than other eye drops, while also containing other essential nutrients for the eye such as Vitamin B12, and Vitamin E, etc., to help nourish your eyes and help it function properly. This eye drop contains Neostigmine methyl sulfate, Vitamin B12, and Vitamin E, the three essential components to help the muscles in your eyes function smoothly and prevent blurred vision. 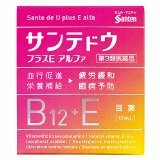 Sante is a pretty well-known eye drop brand in Japan, and I am sure that it will satisfy your needs, supporting your eyes to function at its optimal best at all times. So I highly recommend you giving this eye drop a try.